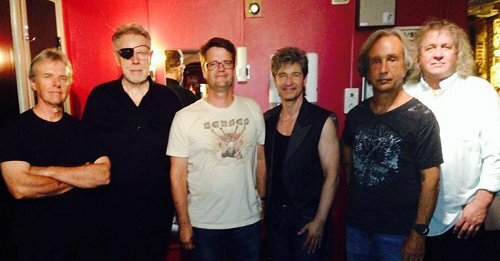 The war with Gaza has made the American prog-rock band, KANSAS, decide to cancel their first-ever planned performance in Tel Aviv, Israel. This was a huge blow for the band’s fans in Israel. Although the Gaza war started in July 8th, the band did not cancel right away. Everyone waited for an official ceasefire. When that didn’t happen, the band said “we can’t make it” and angered ticket-buyers. In over 40 years of existence, Kansas never visited Israel. The band focused on the U.S. market, even ignoring major parts of Europe. Their 40th annivesary tour was supposed to be a landmark opportunity for Israeli fans to witness the band in an excellent venue (the revamped Tel Aviv’s Culture Hall, ideal for classical music), on Tuesday, August 5th 2014, shortly before the departure of Steve Walsh (vocals and keyboards) in mid-August. Israeli production company, ProgStage, promised Israeli customers that Kansas will not cancel because of the war. It seems like the band just wanted to wait and see what happens, but eventually they couldn’t risk it. Israeli rock fans have seen many cancelations of foreign artists recently. The war with Gaza, and the problematic security situation has made Neil Young, The Backstreet boys, America, Paul Anka and Chick Corea have all had to cancel. The German progressive-electronic band Tangerine Dream also had to cancel a show in Tel Aviv, following low ticket sales, even with no relation to any war. The Rolling Stones was the biggest name to perform in Israel lately. Justin Timberlake also managed to make it before the war broke out. In light of repeated rocket attacks on Israel’s major cities, including Tel Aviv, the police and the home front command have ordered all outdoor performances to move to indoor facilities. This political sad turn of events will force many prog-rock fans in Israel to take “rock trips” by airplanes, to see bands perform in Europe. Mitkadem.co.il is the Hebrew guide to progressive rock, focusing on Israeli readers. This entry was posted in american prog rock and tagged kansas band. Bookmark the permalink. Kate Bush Live 2014: What went wrong?